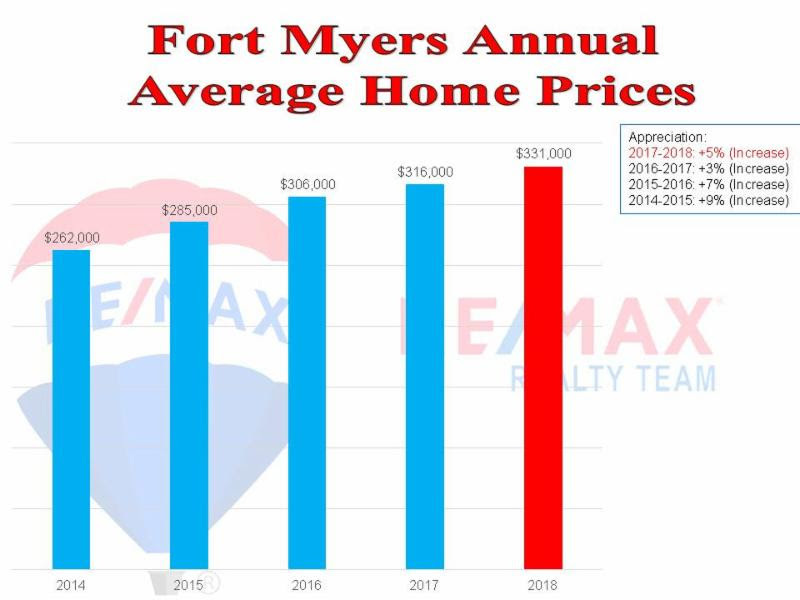 Despite several interest rate hikes and the negative effect that the red tide/algae problem had on our local economy in 2018, our real estate market had another positive year…. the eighth straight year of rising prices. The charts below will illustrate more precisely how our 2018 local real estate market fared. Tom: This price differential has remained fairly constant for several years. And for those very wealthy buyers, Naples & Marco Island waterfront home prices are about 400% higher than Cape Coral. 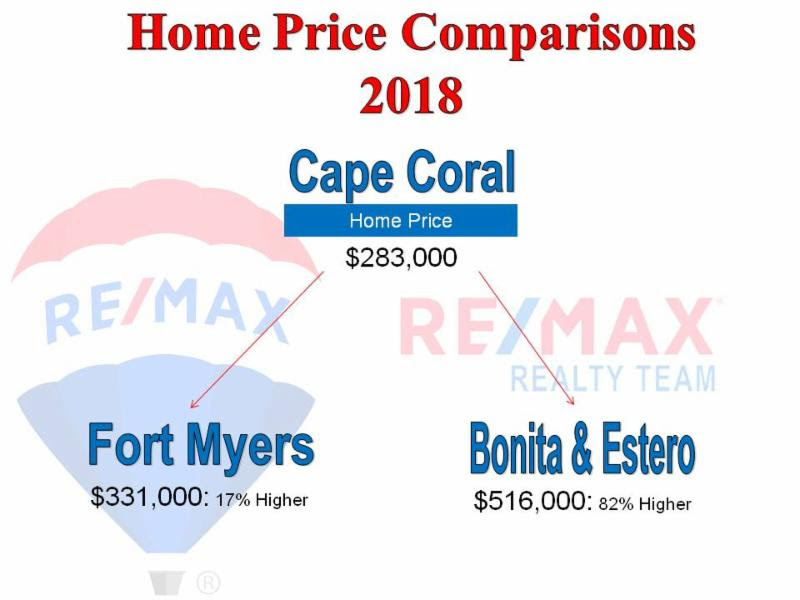 Most of the waterfront price differential is because of the amount of waterfront each city has, with Cape Coral having far more miles of canals than these cities or any city in the world. 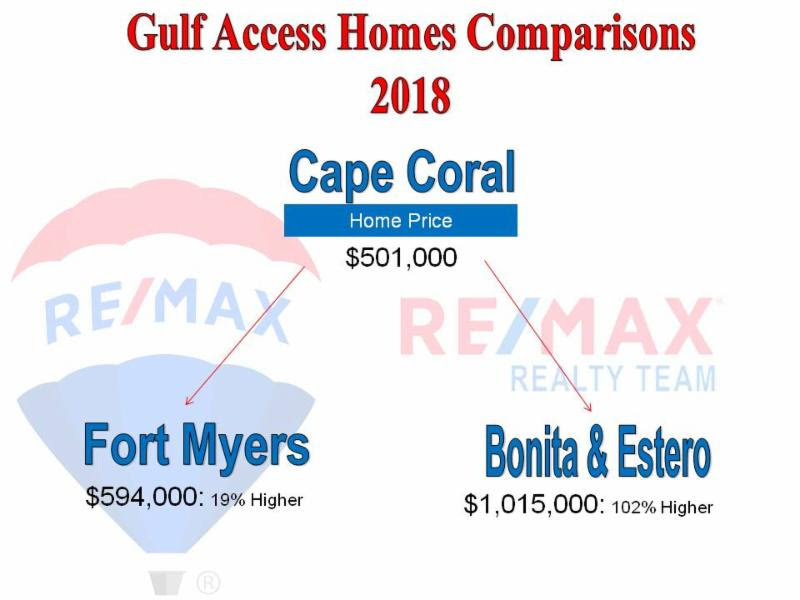 Gulf-access home prices in Cape Coral increased from $480,000 in 2017 to $501,000 in 2018, the 9th straight year of gulf-access home price increases ($307,000 in 2010). 4. 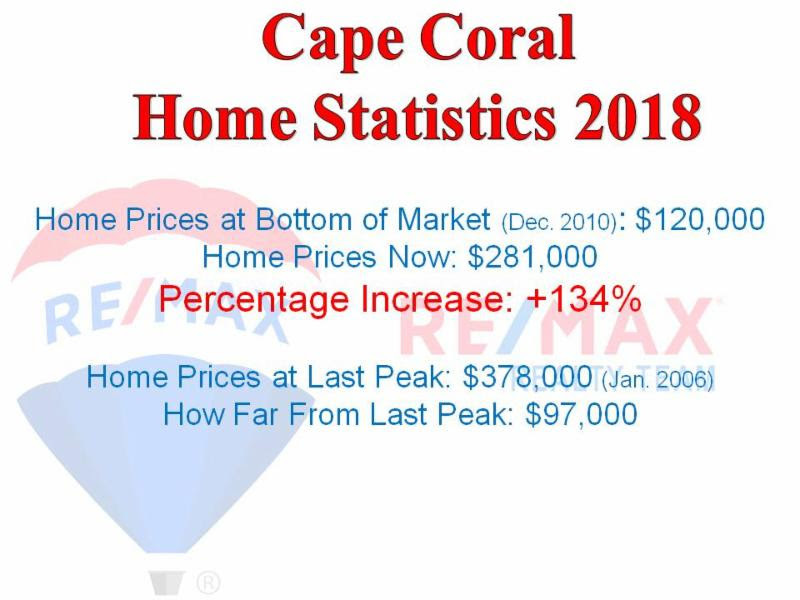 Because 10,000 new residents (not counting seasonal owners) are projected by the U.S. Census Bureau to relocate to Cape Coral each year, interest rates are still historically low, and new construction has not caught up to demand, it is very difficult to foresee a 2007 – 2009 type downturn occurring. 5. There are two more key factors that point to a more normalized “Shift”. One is that builders and investors have not overbuilt new homes as they did in 2005 & 2006. 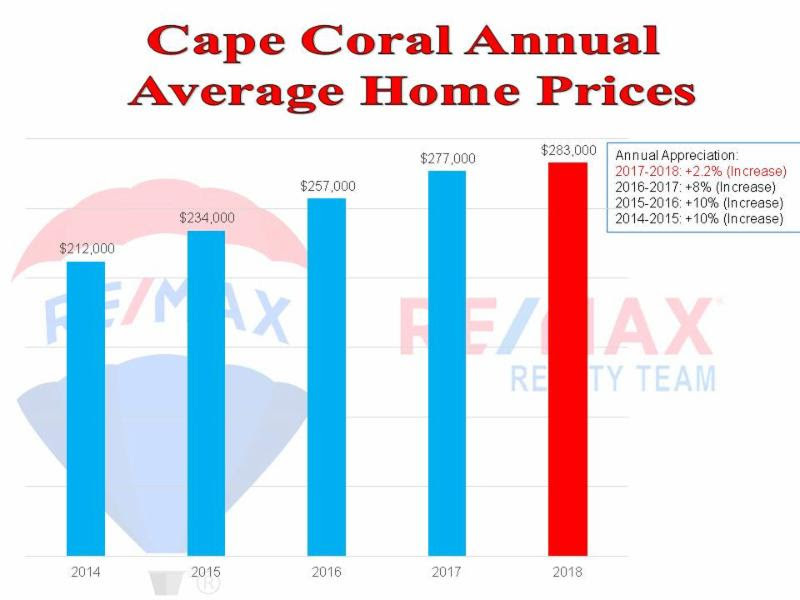 We are averaging about 200 new homes a month in Cape Coral, whereas builders/investors were putting up over 500 homes a month in the last peak cycle, far too many for the number of buyers. Equally important is that lenders are not giving out home loans willy-nilly to borrowers that should never have qualified at the last peak. Cape Coral: 46 homes sold at $1 M or higher, at $1,445,000 average sales price. This was 4 more sales and $73 K higher average luxury home price than in 2017. 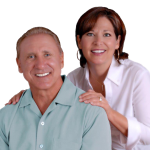 Sue: we were fortunate to have sold $1 M + Cape Coral homes in 2016, 2017, and 2018. On the same day, DeSantis demanded the resignations of all nine members of the South Florida Water Management District, which oversees the Everglades area. The board in November extended a lease with sugar farmers for land needed for a reservoir that is key to water purification efforts, angering DeSantis. The order also directs the Department of Environmental Protection, Department of Health and the tourism agency Visit Florida to work together to address algae problems. Tom: it is most encouraging that a serious and ongoing effort is taking place to finally address our water issues. If you bought a Florida home or condo in 2018 and it will be your primary residence don’t forget to file for your Homestead Exemption with the Assessor’s Office by the end of March. Homestead is one of the many outstanding tax benefits for Florida residents, so don’t let it slip by. Click here for further information regarding Homestead filing on the Lee County Property Appraiser's website. Chiquita Boat Lock Decision Delayed: There has been a challenge to the Florida DEP's approval of the removal of the lock by the Matlacha Civic Association. A hearing has been scheduled for early March. A vast majority of our waterfront clients living behind the lock want it removed but some folks don't want it removed and prefer for a high-speed new lock to be installed. Many of the people dissenting live in Pine Island. Single Women Buying More Homes: Single women are the fastest growing demographics in home ownership, now owning 22% of all homes, while single men own 13%. Sue: Why the big differential favoring women? Hmmmm! Could it be that women are better money managers? Florida Realtors 2018 Homebuyer Profile: Average Florida buyer is 57 years old with an income of $85,000, versus 46 years old and a $91,000 income for U.S. buyers. Fed Unlikely to Raise Rates Soon: The Federal Reserve's December meeting minutes suggest that interest rate hikes are unlikely in the next several months so that policymakers can gauge the economy and recent stock market instability.